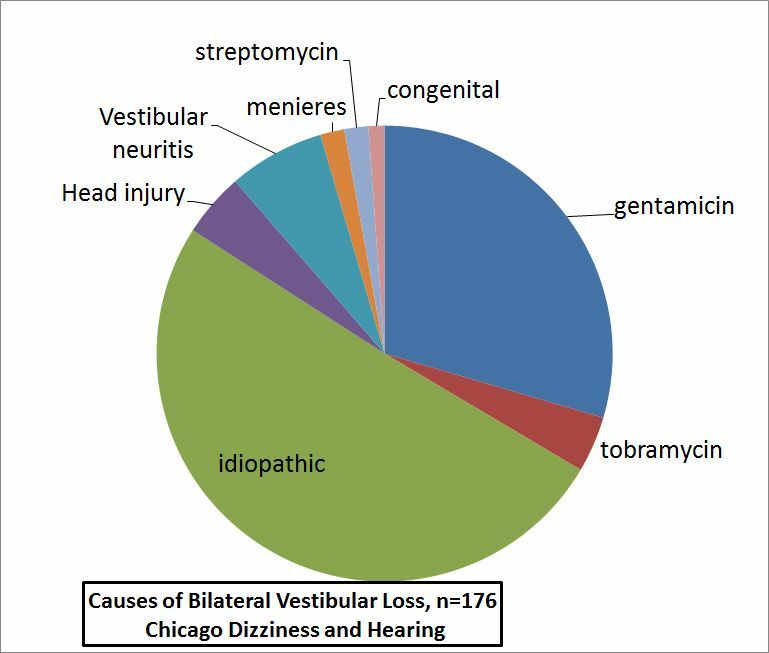 Gentamicin is the most common single identifiable cause of bilateral vestibular loss that we encounter in our practice (Chicago Dizziness and Hearing). The majority of cases are "idiopathic" -- meaning not an identiable source. updated: 2014. Gentamicin is a commonly used antibiotic medication. Gentamicin toxicity is the most common single known cause of bilateral vestibulopathy. In our own practice, Gentamicin causes about 1/3 of all bilateral cases. The literature suggests that Gentamicin is the cause of between 15-50% of all cases. Looking at things from the other side, a review of 1976 patients receiving gentamicin or another similar (aminoglycoside) antibiotic showed that about 3% developed some sort of vestibular injury (Kahlmeter and Dahlager, 1982). Commercial gentamicin is a complex of several compounds -- the major compounds (C1, C2, C1a) and some minor compounds. The C2 compound has the strongest ototoxic effects, while the C1a compound is more vestibulotoxic than ototoxic (Kobayashi et al, 2008). Bilateral vestibulopathy, discussed in more detail here, occurs when the balance portions of both inner ears are damaged. The symptoms typically include imbalance and visual symptoms. The imbalance is worse in the dark, or in situations where footing is uncertain. Spinning vertigo is unusual. Figure1: When a person has bilateral vestibular damage, such as may result from Gentamicin toxicity, they may experience oscillopsia. When the head is moving, objects blur. When driving one may be unable to see signs clearly on a bumpy road. Figure 2: Typical audiogram of person exposed to gentamicin. Hearing is commonly normal through 4000 hz, and then falls off at higher frequencies. Often persons with significant vestibular damage from gentamicin do not notice any change in their hearing. Gentamicin is a member of the family of antibiotics called aminoglycosides. All aminoglycosides are ototoxic. This includes kanamycin, tobramycin, streptomycin, neomycin to name just a few. Thus there are numerous other aminoglycoside ototoxins, but most affect hearing to a greater extent than balance. (Note that gentamicin is spelled with a terminal "icin", unlike most other drugs in the same aminoglycoside family, that end with "mycin", the difference in spelling from the other aminoglycosides such as streptomycin reflects the different species of origin of this antibiotic (Begg and Barclay, 1995). More importantly, the vestibular system can be damaged with gentamicin. The exact incidence of vestibulotoxicity when gentamicin is administered is humans is presently estimated to be about 3%(Kahlmetera and Dahlager, 1982), but as little as 0.15% incidence has been reported (Nicolau et al, 2003) in closely monitored settings. However, this statistic is open to question as not only have very few prospective studies of vestibular function been done, but it is also difficult to detect vestibular damage until it is profound. It seems likely that significant vestibular damage does not occur as frequently as the subtle hearing impairment reported above (5-10%). The author's "ball-park" estimate is that about 1% of all 2 week courses of gentamicin result in significant vestibular toxicity. In pathologic studies, severe aminoglycoside toxicity is associated with death of inner ear hair cells (Plogar et al, 2001). Doses that are not enough to kill hair cells may damage their motion sensitive hairs (sterocilia), making them unable to respond to motion, at least for some months. ( Oei, Segenhout et al. 2004). In humans, pathologic and clinical (e.g. VEMP) data suggests that the otolithic hair cells are less sensitive than the canal hair cells to gentamicin. In rodents however, it appears that both otoliths and canals are affected equally (Oei, Segenhout et al. 2004). A peculiar finding in rodents is the formation of "giant otoconia" due to dissolution of normal size otoconia and reformation as giant ones (Tukumeda et al, 1997). Whether or not that this occurs in humans is presently unclear. If it does, it might account for some unusual variants of BPPV. More temporal bone studies with humans are sorely needed ! If you have gentamicin ototoxicity, please consider donating your inner ear to the temporal bone registry, in the event of your death. The auditory ganglion is spared (Tsuji et al, 1999) although there are some dissenters (Hinojosa et al, 2002; Roehm). If the ganglion is spared,it is concievable that an inner ear prosthesis similar to a cochlear implant might be designed to remedy this condition. The mechanism of aminoglycoside ototoxicity remains unknown but it appears to involve both apoptotic (programmed cell death) pathways as well as formation of free radicals (for a review see Forge and Schacht, 2000). Some authors suggest that the mechanism of toxicity is through reduction of mitochondrial protein synthesis (Guan et al, 2000). Interference with mitochondrial function is a logical suggestion as mitochondria are similar to bacteria in many ways, and interference with mitochondrial would be expected to cause cellular disruption through reduction in ATP production. Diagnosis is generally not difficult. What is required is exposure to gentamicin, documentation of bilateral vestibular reduction, and exclusion of reasonable alternatives. Although there are sporadic reports of individuals developing gentamicin toxicity after a single ordinary dose (e.g. Halmagyi et al, 1994; Ahmed et al, 2012), practically this is extremely rare and very unlikely. It probably requires the person to have a susceptibility mutation in their mitochondria -- not a common situation at all. Most patients with significant and persistent gentamicin ototoxicity have an exposure for 2 weeks or longer. With respect to documentation of bilateral vestibular reduction (paresis), the rotatory chair test is preferred. Caloric testing can sometimes indicate absence of function when there actually is considerable function. VEMPs are reduced or absent in most cases of significant aminoglycoside ototoxicity. This is particularly an issue when ice-calorics are not done, or air is used. Active head rotation tests such as the "Vortec" or "VAT" are inferior to rotatory chair testing. Hearing testing including both audiometry as well as OAE testing is generally not useful except in excluding alternative diagnoses. Similarly, fistula testing and ABR testing have no role other than to exclude alternative diagnoses. Posturography is often helpful. Sometimes patients who have been exposed to gentamicin pretend to have greater disability than is truly the case, in an attempt to obtain compensation through the legal system. In other words, malingering is possible. This situation can usually be detected by an astute and experienced clinician who has a set of tests done both acutely and after 2+ years. . Alternative diagnoses that should be considered are other sensory ataxias (especially proprioceptive loss, as can be found in diabetics), cerebellar ataxias, orthostatic hypotension, BPPV (which is common acutely in gentamicin toxicity -- see Black et al, 2004), and malingering (mainly encountered in situations where people are hoping to be paid to be ill -- also see here). dose and kidney function, especially "area under curve" of blood gentamicin level. At the present writing (2012), there does not appear to be a definitive answer. Some literature suggests that gentamicin completely unpredictable, based on retrospective reports of toxicity in odd situations, sugh as single doses of ordinary amounts of gentamicin. It is interesting to note that papers reporting toxicity from single doses of gentamicin are from the same group in Sidney Australia (e.g. Halmagyi et al, 1994; Ahmed et al, 2012). In the author's very large experience with gentamicin ototoxicity, only a single patient fit the single dose profile -- after getting 100 times the usual dose. Propsective studies of thousands of patients getting gentamicin with careful monitoring also provide no documentation of this odd outcome (Niclau et al, 1995). It is difficult to imagine a biological or physiological mechanism for gentamicin toxicity to occur after a single dose of gentamicin in the usual dosing range, in someone with normal kidney function. To sum up, we do not think that the toxicity of gentamicin is random and unpredictable as the Australians report -- perhaps there are genetic differences in the Australian population being studied, or perhaps dosing was different than realized in these studies. The goal of gentamicin treatment is to eradicate microbacteria while doing the least amount of bystander damage (ototoxicity and renal toxicity). Microbacteria seem to be mainly killed by having a high peak level, and the ear seems to be mainly damaged by the total dose. In the last decade, dosing strategies have evolved from three times/day into once a day formats. Once a day gentamicin dosing or once every 48 hour dosing is almost universally used now when patients are discharged to home and are given a course of aminoglycoside medication by visiting nurses, and it also has become the most common paradigm of use in the hospital setting. This method may reduce toxicity as well as reduce emergence of resistant strains of bacteria. In this situation, doses or intervals are adjusted using levels drawn at 6-14 hours after administration. These are neither peak nor trough levels, but rather more of a mid-course measurement. Depending on the level and time, an appropriate dosing interval can be chosen or the dose readjusted using the Hartford Nomogram (Nicolau et al, 1995). Ototoxicity is rare in this setting -- only 3/2000 patients developed vestibulotoxicity in the Hartford Hospital trial (Nicolau et al, 1995). Nevertheless, significant ototoxicity is possible even with recommended dosing (Dhanireddy et al, 2005). Gentamicin is occasionally given three times per day, generally in the hospital setting, with a total dose per day ranging from 3 mg/kg to 7.5 mg/kg. Doses are "tuned" by comparing blood levels of gentamicin with target levels, for particular times after the dose. A "peak" level might be drawn shortly after a dose, and a "trough" level just before the next dose. For three times/day dosing, ordinarily a peak level of 5-10 and a trough level of < 2 is aimed for ( Keller et al). As the once a day protocol uses gentamicin doses 3 times those of the three times/day protocol, and peaks in this situation are 3 times higher, it is clear that peak levels per se, are not a good predictor of vestibulotoxicity. Gentamicin is excreted unmodified by the kidneys, and thus the levels in the blood can be predicted closely if the kidney function and the volume of distribution is known. Usually the initial dose of gentamicin is estimated from a combination of patient weight/height and knowledge of kidney function. As long as kidney function remains stable, there is very little that can affect the timing of gentamicin in the blood. While many assume that gentamicin toxicity is caused by an overdose, and that one is safe if the peaks and troughs remain with the the limits noted above, the situation is actually much more complex. We have gone over this in some detail in a separate document on gentamicin pharmacokinetics. To summarize, at this writing (2003), it appears that aminoglycoside related ototoxicity depends on multiple factors, and because there is little human data, many of these factors remain obscure. The peak level is clearly not as important as was previously thought. The AUC (area under the curve of gentamicin in the blood) presently appears to be a likely predictor of ototoxicity. Nephrotoxicity (kidney damage) is more common than ototoxicity. In the Hartford hospital trial, it occured in 1.2% of patients, roughly an order of magnitude more frequently than ototoxicity. When the kidneys are damaged, gentamicin can build up and cause more damage -- a very dangerous situation. For this reason kidney function is usually monitored during courses of gentamicin, with serum creatinine levels. Certain serious infections are conventionally treated with a prolonged dose of gentamicin or other drugs. These include osteomyelitis, and endocarditis as well as serious and overwhelming infections. Potentiating medications: There may be increased risk of ototoxicity from gentamicin if other ototoxic drugs such as cisplatin (a chemotherapy agent) and vancomycin (another antibiotic), are given at the same time. There is also some suspicion on the author's part that another antibiotic, metronidazole, may potentiate gentamicin ototoxicity. Because gentamicin "sticks" to the inner ear for long periods (Aran, 1995), it may not even be necessary that these other drugs be present at the same time. In other words, a person who has a 3 week course of gentamicin, followed by a 3 week course of vancomycin, may have toxicity similar to taking both drugs together. This idea, so far untested with an experiment, is the logical consequence of the fact that gentamicin persists in the inner ear for up to a year after administration. Vancomycin dosing may be "tuned" using levels in a somewhat similar way as gentamicin dosing, leading to the possibility of very complicated pharmacokinetic situations. These logistical problems become more difficult in settings where it may be difficult to monitor and adjust drug levels (i.e. home administration). There also appears to be a synergistic effect of loop diuretics such as furosemide or ethacrynic acid (Ding, 2001; Jang et al, 2015), and also loud noise (Aran et al, 1992), when combined with gentamicin which increases ototoxicity. The potentiating effect of loop diuretics is likely related to a more rapid entry of gentamicin into the ear (Wang et al, 2013). Thus they would likely have to be given at the same time as gentamicin. Ear drops containing gentamicin as well as related antibiotics may be ototoxic if given over a prolonged time to individuals with perforated ear drums. Click HERE for more information about this. So far, nothing has been found that protects one from gentamicin ototoxicity other than avoiding gentamicin exposure. Some efforts have been made with respect to use of antioxidants, mainly using "alternative" preparations. For example, Choung et al (2011) as well as Tian (2013) suggested that Korean red ginseng prevents gentamicin induced hearing loss. Much more study, including human trials, is needed before adopting this as a "treatment". In rabbits, Pavlidis et al (2013) recently reported that memantine (an Alzheimer's medication), administered as ear drops, was beneficial to rabbits treated with amikacin (an aminoglycoside). This is interesting data concerning rabbits, and perhaps might point towards a future treatment. We are puzzled how ear drops might affect the inner ear, as ordinarily, ear drops do not enter the inner ear, due to the ear drum blocking drops from entering the middle ear. See our comments about this article in the reference section too. Genetic susceptibility: Some individuals have an unusual susceptability to gentamicin or streptomycin ototoxicity related to a mutation of mitochondrial RNA (Fishel-Ghodsian et al, 1997;Gardner et al, 1997; Usami et al, 2000). It is called the "A1555G" mitochondrial mutation. Another point mutation is at the C1494T locus. This susceptability is passed on genetically through the mother and occurs in as many as 17% of individuals with hearing loss after aminoglycoside exposure (note that this paper was concerned with hearing, not vestibular loss). It does not appear to be a predictor of vestibular loss -- but only of hearing. A patient with idiopathic loss of vestibular function has also been reported with mitochondrial abnormalities (Baloh et al, 1997), and some pedigrees have been reported with both sensorineural deafness and aminoglycoside sensitivity (El-Schahawi et al, 1997). Other sites in the cell other than the mitochondria such as the golgi apparatus might also be the locus for additional susceptibility mutations (Blackburn and Avery, 2003). Hearing loss is also common in Kearns-Sayre, a disorder with mitochondrial disturbances as well as other mitochondrial disorders. There are occasional reports of ototoxicity after a single ordinary dose of gentamicin (e.g. Halmagyi et al, 1994; Nicolau et al, 1995). Little is known about the details of these cases, but perhaps they represent persons with susceptibility mutations. In our opinion, these are extremely unusual cases that should not be used to formulate one's policy concerning gentamicin use. Age: In general, older people are more susceptible than younger people to gentamicin toxicity. This may relate to a steady attrition of vestibular neurons during life, so that by the age of 80, approximately 50% of vestibular ganglion cells have died, even in normal persons. Little is known about toxicity in children. Aust (2001) suggested that children are less prone to develop vestibulotoxicity from gentamicin than adults. Fjalstad (2013) suggested that neonates are also less prone due to a higher volume of distribution. This is not certain, however, as most animal data suggests the opposite. In mice, newly born mice accumulate gentamicin sooner than adults (Steyger and Dai, 2003). In cat, neonates are also more sensitive to gentamicin than adults (Bernard 1981). Gentamicin is probably also toxic to the ear of the developing fetus as related drugs (e.g. streptomycin) have been shown to have this problem (see Boradori et al, 1997). Gentamicin-impregnated beads, used for osteomyelitis, do not appear to be a significant source of ototoxicity (Haydon et al, 1993). In general the message is modestly encouraging. People can recover from ototoxicity, although the process is slow and usually incomplete. The majority of the improvement occurs at high-frequencies on rotatory chair testing -- high-frequency gain usually returns to normal after several years, but remains depressed for lower frequencies. To establish long term prognosis, a rotatory chair test done after 2 years is very important. Progression of vestibulotoxicity can occur for months after the last dose, and recovery can be measured out to a year or even longer (Black et al, 2001). Gentamicin toxicity, by itself, never causes so severe imbalance as to require a wheelchair on a permanent basis -- if one is necessary, it is generally only in the first year. A discussion of prognosis in 35 patients was recently reported by Gillespie and Minor (1999). Gentamicin toxicity combined with other conditions -- such as peripheral neuropathy, or visual impairment, can result in being wheelchair dependent. Activity and vestibular rehabilitation speed recovery. Additional exposure to ototoxins, a sedentary life style, and habitual use of sedative medications (such as amitriptyline or diazepam) probably slow recovery. At this writing, there are no ongoing inner ear monitoring protocols that are customary and that can reliably prevent gentamicin toxicity, and it seems unlikely that they are even possible. The difficulty is that the toxicity is delayed -- it may not cause clinical symptoms for a week after intake, and damage can progress for months after the drug has stopped. Vasquez and Mattucci have proposed a protocol involving audiometry, otoacoustic emissions, ENG, and a clinical symptom checklist. It seems unlikely that this extensive protocol will be adopted for all patients on ototoxic medications, but it may be useful for particular high-risk situations. These might include persons on large and prolonged doses of gentamicin, administration of gentamicin with a potentiating agent (such as vancomycin or furosemide), in persons with significant renal disease, and persons with preexisting ear disease. Fausti and associates (1994) used high-frequency audiometry in an attempt to detect ototoxicity. Only 37% of ears tested in this way showed a significant hearing reduction, from a mean duration of 11.4 days of treatment with several different aminoglycosides. Can high-frequency audiometry provide early warning of ototoxicity ? This study does not address this point as the drugs monitored varied in their propensity to cause hearing loss and also there was no attempt to correlate vestibulotoxicity with audiometric findings. Another problem is that older people generally lose high-frequencies anyway, leaving nothing to measure. Otoacoustic emissions, particularly those obtained at extremely high frequencies, also have a potential to detect ototoxicity. We have not found them to be useful in practice, as older people generally have no OAE's, and practically OAE's do not seem to be very sensitive to gentamicin. To us, it seems that the logical approach would be to use a predictive model - -that combines together information about age, kidney function, inner ear status and drug levels to develop a risk profile for ototoxicity and that delivers warnings when certain events that predict poorer prognosis occur (such as reduction in kidney function, symptoms of nausea or unsteadiness, or unexpected alterations in blood levels of gentamicin). To our knowledge, no formal model of this kind presently exists, although experienced clinicians presumably use something of this nature when they make clinical decisions. Basic therapeutic guidelines, mainly addressing empiric vs. directed theory, are offered by the online journal "Australian Prescriber" here. Please see our Bilateral Vestibulopathy Page for further information regarding diagnosis, treatment, prognosis, and research efforts related to otoxicity. Beaubien, A. R., S. Desjardins, et al. (1989). "Incidence of amikacin ototoxicity: a sigmoid function of total drug exposure independent of plasma levels." Am J Otolaryngol 10(4): 234-43. Beaubien, A. R., E. Ormsby, et al. (1991). "Evidence that amikacin ototoxicity is related to total perilymph area under the concentration-time curve regardless of concentration." Antimicrob Agents Chemother 35(6): 1070-4. Becvarovski, Z., E. M. Michaelides, J. M. Kartush, D. I. Bojrab and M. J. LaRouere (2002). "Rapid elevation of gentamicin levels in the human labyrinth following intravenous administration." Laryngoscope 112(7 Pt 1): 1163-5. Bernard, P. A. (1981). "Freedom from ototoxicity in aminoglycoside treated neonates: a mistaken notion." Laryngoscope 91(12): 1985-94. Chuck, S. K., S. R. Raber, et al. (2000). "National survey of extended-interval aminoglycoside dosing." Clin Infect Dis 30(3): 433-9. Dayal, V. S., G. E. Chait, et al. (1979). "Gentamicin vestibulotoxicity. Long term disability." Ann Otol Rhinol Laryngol 88(1 Pt 1): 36-9. Dulon, D., H. Hiel, C. Aurousseau, J. P. Erre and J. M. Aran (1993). "Pharmacokinetics of gentamicin in the sensory hair cells of the organ of Corti: rapid uptake and long term persistence." Comptes Rendus de l Academie des Sciences - Serie Iii, Sciences de la Vie 316(7): 682-7. Fjalstad, J. W., et al. (2013). "High-dose gentamicin in newborn infants: is it safe?" Eur J Pediatr. Friberg O, Jones I, Sjoberg L, Soderquist B, Vikerfors T, Kallman J.Antibiotic concentrations in serum and wound fluid after local gentamicin or intravenous dicloxacillin prophylaxis in cardiac surgery. Scand J Infect Dis. 2003;35(4):251-4. Gendeh, B. S., H. Said, et al. (1993). "Gentamicin ototoxicity in continuous ambulatory peritoneal dialysis." Journal of Laryngology & Otology 107(8): 681-5. Goode CT, Carey JP, Fuchs AF, Rubel EW. Recovery of the vestibulocolic reflex after aminoglycoside ototoxicity in domestic chicken. Hinojosa R, Nelson EG, Lerner SA, Redleaf MI, Schramm DR. Aminoglycoside ototoxicity: a human temporal bone study. Laryngoscope 2001; 111: 1797-805. Kobayashi, M., et al. (2008). "Comparisons of cochleotoxicity among three gentamicin compounds following intratympanic application." Acta Otolaryngol 128(3): 245-249. Kusunoki, T., S. Cureoglu, et al. (2004). "Effects of gentamicin on sensorineural elements of the cochlea in human temporal bones." Am J Otolaryngol 25(5): 313-7. Manley HJ, Bailie GR, McClaran ML and Bender WL (2003). "Gentamicin pharmacokinetics during slow daily home hemodialysis." Kidney Int 63(3): 1072-1078. Oei, M. L., H. M. Segenhout, F. Dijk, et al. (2004). "Functional and anatomic alterations in the gentamicin-damaged vestibular system in the guinea pig." Otol Neurotol25(1): 57-64. Prazma, J., D. S. Postma, et al. (1976). "Ototoxicity of tobramycin sulfate." Laryngoscope 86(2): 259-68. Tian, C. J., et al. (2013). "Red ginseng protects against gentamicin-induced balance dysfunction and hearing loss in rats through antiapoptotic functions of ginsenoside Rb1." Food Chem Toxicol 60: 369-376. Wang, T., et al. (2013). "Bumetanide hyperpolarizes madin-darby canine kidney cells and enhances cellular gentamicin uptake by elevating cytosolic Ca(2+) thus facilitating intermediate conductance Ca(2+)--activated potassium channels." Cell Biochem Biophys 65(3): 381-398. Zheng JL, Keller G, Gao WQ. Immunocytochemical and morphological evidence for intracellular self-repair as an important contributor to mammalian hair cell recovery. J Neurosci. 1999;19(6):2161-70. CBC news article on bilateral loss.